The Primary Chronicle also known as the Tales of Bygone Years is the history of Kievan Russia from the year 850 to about 1110. It is the best guide to the history of Russia during this time. Without it, we would have little knowledge of how Russia came to being as well as how the Varangians (Episode 1) came to the land of the Rus. The monk Nestor is believed to have put together the original compilation in 1113. He worked at the court of Grand Prince Sviatapolk II of Kiev. 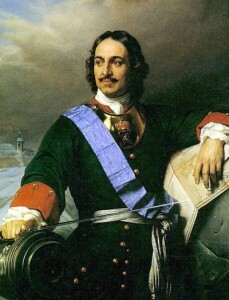 Sviatapolk’s reign was marked by his battles with his cousin, Vladimir Monomakh. While he was unchallenged as Grand Prince (Veliki Knaiz), he was deeply disliked. 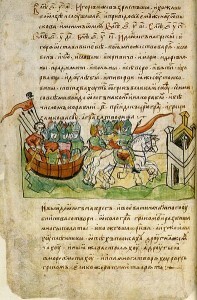 In 1116, the head of the Vydubetsky Monastery in Kiev, hegumen Sylvester of Kiev is said to have updated the Primary Chronicle while some believe he may have compiled it instead of Nestor. Grand Prince Monomakh was a patron of Sylvester’s and helped him to create the works. This version is the first one that we have access to although very little of it has passed on to us in the present day. While we don’t have the original manuscripts, we do have two versions that were written a few centuries afterwards. 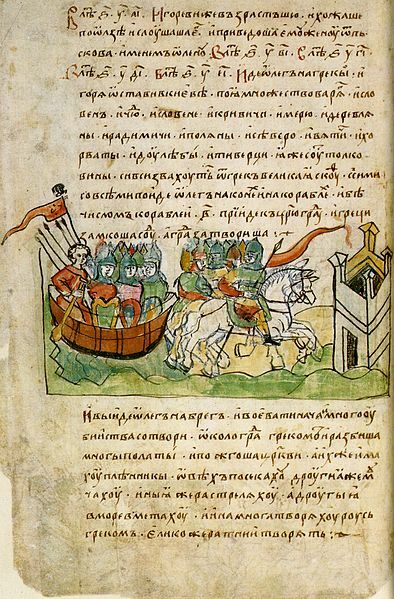 This first one, written in the 1300’s, is called the Laurentian codex and was compiled by the Nizhni Novgorod monk Laurentius for Mikhail of Tver. The years 898–922, 1263–83 and 1288–94 are missing for unknown reasons. The third version is known as the Hypatian codex and it was compiled in the 1500’s and is the most complete one we have. It was written in Old Church Slavonic and provides us much of the missing information that was not included in the older Laurentian codex. There are many versions of the Primary Chronicle, each with corrections and revisions. What is so unique about the Primary Chronicle is that it is the only information we have about life in Kievan Rus. Throughout Europe, we have numerous tales about Medieval times from multiple sources. 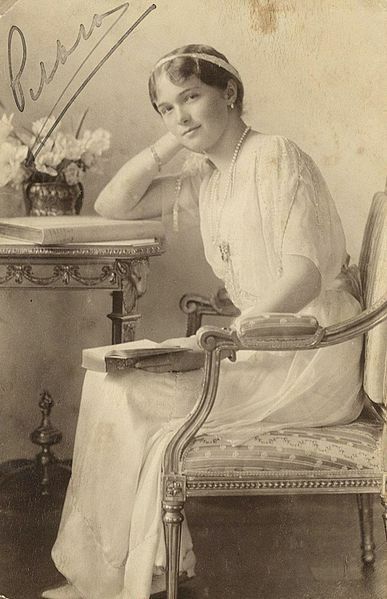 On this day in 1895, Grand Duchess Olga Nikolaevna Romanova was born to Tsarina Alexandra Fyodorova and Tsar Nicholas II. She would be murdered with the rest of her family on July 17, 1918 when she was just 22 years of age. Because of her murder, she, along with the rest of her family were canonized by the Russian Orthodox Church as a passion bearer. As an aside, you might notice that her last name is Romanova and not Romanov. In Russia, females have different last names from the males, so in her case, an “a” is added to the end. If the ends in a “y” like Rimashevsky, the feminine would be Rimashevskaya. Peter the Great was the Augustus of the Russian Empire. He single-handily moved the Russian people out of their dark Oriental age to an age where they joined the European community. The Turks and the Swedes tried and ultimately failed to bring him to his knees. He learned from mistakes and rarely made the same one twice. To follow this great man through my podcasts start here and start with Episode 27 – Peter Likes to Play War. Welcome to the Russian Rulers History Blog Site!!! Welcome to all my loyal listeners and those who haven’t yet listened to my podcast, Russian Rulers History. I started this journey in April of 2010 and have gone way beyond where I thought it would be. Back then I thought I would get through Russian history in just 50-60 episodes but it is already over 100 strong. Instead of ending the podcast with Vladimir Putin, I will extend things well beyond that as I will leave the rulers and start concentrating on events and people who contributed to the glorious history of Russia. Join me here and at my podcast site which you can reach here, or you can join our growing group on Facebook at the Russian Rulers History Podcast group.